Ahh, Boulder. Scott Carpenter Park, just around the corner from our house, has a public municipal swimming pool that keeps the kids cool all summer. Now that summer is over, the pool is officially closed for the season--to people. 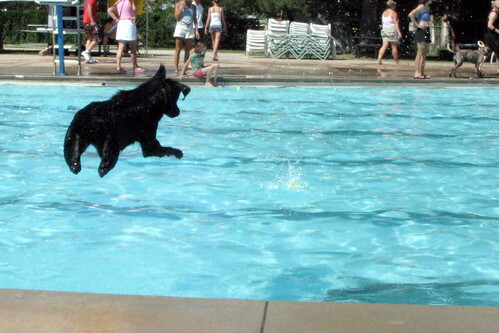 Boulder being dog-crazy Boulder, that does not mean the pool is yet closed for good to all creatures, though. 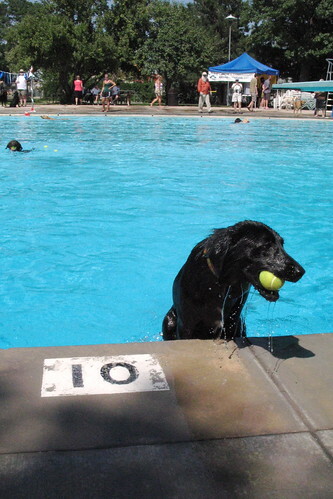 No, after a de-clorination process last week, the pool was officially open to dogs starting this weekend and extending to next weekend. Yeah (woof)! Naturally, upon hearing of this insanity, we made plans to participate. We arrived at the pool parking lot Saturday afternoon--surrounded by vehicles with filthy pickup beds and festooned with decals like "my Border Collie is smarter than your honors high school student"--and headed into the melee. Once inside the gate, we paid our five bucks, took Hoop's leash off, and the games began. Now, Hooper loves to swim in the reservoir by the East Boulder Dog Park, but that has a sandy beach and a nice gradual slope into the water; this is where he learned to swim. But this pool business, all concrete and with an abrupt transition from land to water, well, this took a second to adjust to. Seriously, like, a second. Watching the dynamics involved with roughly forty dogs running around, all overloaded with the sensory stimuli of having an entire human public pool at their disposal, was thrilling, amusing and hysterical. A co-worker appeared, with his wife and their dog Winnie. They were trying to get Winnie to get over her fear of jumping into the water. With Hooper obviously over his fear of jumping off the pool coping, we decided to see if we could tackle the diving boards. There were a couple of dogs over by the diving boards who were seemingly chanelling Greg Lougainis, showing no fear of the bobbing board or of leaping off the end. One dog actually pushed off the end of the board so well that he managed to get the board to bounce a few times after he departed. It sounded really professional, the "boing--splash, boing, boing". I figured Hooper would be a natural, but he displayed a lot of anxiety about jumping off the end. 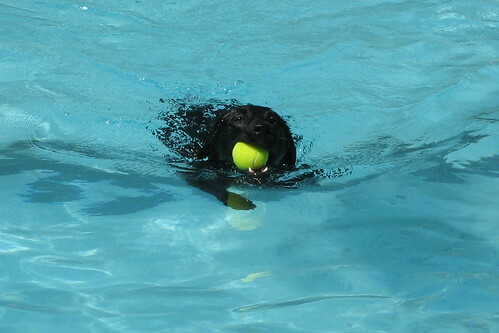 He happily jumped up on the board, and would follow me out to the edge if I showed him the ball, but no matter how I threw the ball into the pool, he just couldn't be enticed to jump off the end. You ask me, he's just showing everyone how smart he is. 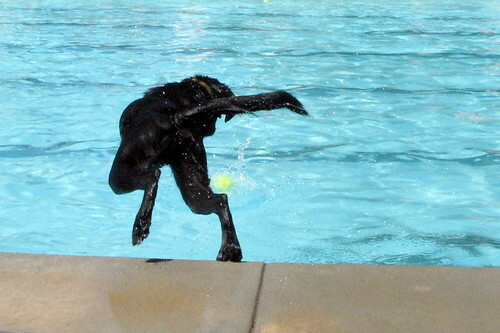 But the pool is open for dog swims next weekend too, and I think I'm gonna bring him back for one more try at diving before winter arrives. All in all, it was a great day and it was fun to watch Hooper take in the newness of the entire experience.